A building's roof provides shelter from natural elements. Various roofing materials are used in buildings. These include asphalt, modified bitumen, metal, and tiles. Rooftops have become major source of excessive heat. The usage of cool roofing systems is an effective strategy to overcome heat issues. Cool roofs are designed to reflect sunlight and absorb less heat than standard roofs. There are many different combinations of roofing systems; the one exposed to the sun regulates the overall temperature. Cool roof systems can be employed to lower the temperature or replace the existing roof materials by reflective materials. Rise in demand for energy-efficient and eco-friendly roofing systems, expansion in the construction industry, and government subsidies and tax benefits are key factors driving the global cool roofs market. The cool roofs market in Asia Pacific has been expanding due to the rapid urbanization, growth in population, and increase in disposable income of middle-class families in the regions. The outlook for the market in Asia Pacific appears promising. Significant expansion in the construction industry and increase in usage of eco-friendly cool roofs in end-use industries are major factors boosting the cool roofs market. Decrease in energy consumption and increase in roof longevity are anticipated to propel the demand for cool roofs in the near future. Growth in residential and commercial industries in developing economies is another factor estimated to augment the cool roofs market during the forecast period. Less awareness among customers about benefits of cool roof is hampering the market. However, new projects and initiatives have been started by governments to promote the usage of cool roofs. Furthermore, rise in demand for environmentally-friendly roofing systems is anticipated to create significant opportunities for the cool roofs market. The global cool roofs market has been segmented based on roof slope, roof type, and application. In terms of roof slope, the market has been be bifurcated into steep slope roofs and low slope roofs. Low slope roofs was the dominant segment with more than 60% share of the market in 2017. In terms of roof type, the cool roofs market has been classified into coated roofs, single-ply membranes, tiles & slates, foam roofs, modified bitumen & built-up roofing systems, asphalt shingles, metal roofs, and others (including wood shake, clay, and concrete). Single-ply membranes was the dominant segment, accounting for about 30% share of the market share in 2017. These membranes are widely employed in low sloped roofs that require extensive repairs. The modified bitumen & built-up roofing systems segment is expected to expand significantly in the near future, due to the increase in demand for durable roofing materials. Metal roofs and coated roofs segments are also gaining momentum in the cool roofs market owing to the rise in demand for low cost and green roofing materials. Based on application, the global cool roofs market has been segregated into residential, commercial, and industrial. Demand for cool roofs is largely driven by rise in output of the construction industry. Growth in residential and commercial sectors, particularly in Asia Pacific, is driving the demand for cool roofs. In terms of region, the cool roofs market has been split into North America, Latin America, Europe, Asia Pacific, and Middle East & Africa. North America experienced the maximum demand for cool roofs in 2017. The region accounted for more than 70% share of the global market in 2017, led by the rise in consumption of cool roofs in the U.S. and Canada. The market in Asia Pacific is estimated to expand at a significant pace during the forecast period due to the growth in the construction industry in developing economies such as India, Vietnam, and the Philippines; and rapid urbanization. The cool roofs market in Germany, the U.K., Italy, France, and Russia in Europe is fragmented. The market in Middle East & Africa and Latin America is projected to expand at a moderate pace during the forecast period. High demand for energy-efficient, durable, and low-cost cool roofs and tax benefits offered by governments of various countries are prominent factors likely to augment the cool roofs market in Latin America and Middle East & Africa during the forecast period. 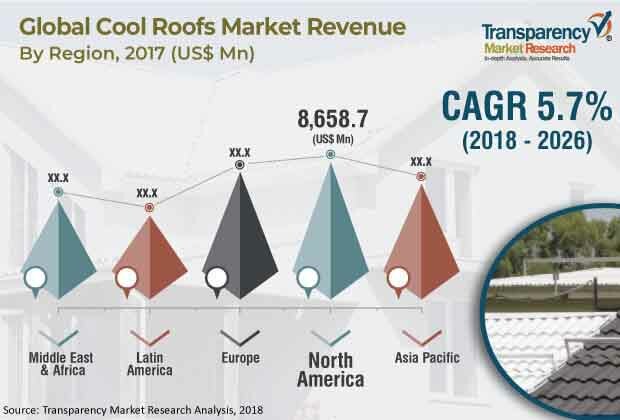 Key players profiled in the report on the global cool roofs market are Owens Corning, Certain Teed Corporation, GAF Materials Corporation, Tamko Building Products, Inc., IKO Industries Ltd., ATAS International Inc., Henry Company, PABCO Building Products, LLC., Malarkey Roofing, and Polyglass S.p.A. This report analyzes and forecasts the cool roofs market at the global and regional levels. The market has been forecast in terms of value (US$ Mn) and volume (Million Square Meters) from 2018 to 2026. The study includes drivers and restraints of the global market. It also covers the anticipated impact of these drivers and restraints on the demand for cool roofs during the forecast period. The report also highlights growth opportunities in the global cool roofs market. The report comprises detailed value chain analysis, which provides a comprehensive view of the global cool roofs market. The Porter’s Five Forces model has also been included to help understand the competition landscape of the market. The study encompasses market attractiveness analysis, wherein roof slope, roof type, and application segments have been benchmarked based on their market size, growth rate, and general attractiveness. The study provides a decisive view of the global cool roofs market by segmenting it in terms of roof slope, roof type, and application. These segments have been analyzed based on the present and future trends. Regional segmentation includes the current and projected demand for cool roofs in North America, Europe, Asia Pacific, Latin America, and Middle East & Africa. The report also covers the demand for these roofs in individual roof slope, roof type, and application segments across all regions. Key players operating in the global cool roofs market are Owens Corning, Certain Teed Corporation, GAF Materials Corporation, Tamko Building Products Inc., IKO Industries Ltd., ATAS International Inc., Henry Company, PABCO Building Products, LLC., Malarkey Roofing, and Polyglass S.p.A. Market players have been profiled in terms of company overview, financial overview, business strategies, and recent developments. The report provides size (in terms of volume and value) of the cool roofs market for the base year 2017 and the forecast for the period between 2018 and 2026. Market numbers have been estimated based on roof slope, roof type, and application segments of the market. Market size and forecast for each major roof type, roof slope, and application segment have been provided for the global and regional markets.